“more light rather than less to make sure you get compact, healthy plants that will transition to the sunny outside world without drama.” You say it so well Joseph! LED is still rather an emerging source of lighting. It is more expensive but not a contributor to potentially spreading more Mercury into living environments as CFLs. 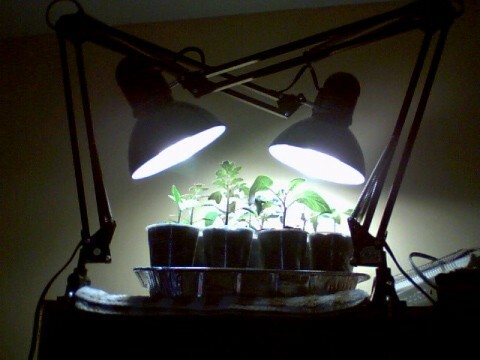 Best bet are the Daylight type CFLs as they usually have a wavelength spectrum closer to what most seedlings need as well as a higher lumens output. Lumens measure the amount of light produced. The more lumens in a light bulb, the brighter the light. Daylight type CFLs generally have higher lumen output. This higher output should result in stockier seedlings. Another alternative is for HO or VHO fluorescents (High Output/Very High Outpout). These can be purchased or easily built. Just requires a specific ballast and bulbs which are more expensive (but still probably not in the LED price range). I don’t think these worth the cost for once a year for a few weeks warriors. I use $43 led shop lights from Wal-Mart- 4500 lumens over about 3 ft.
Good points on CFL lights. I am switching to LED’s even though expensive: more energy efficient, perfect wave length for plants (matches chlorophyll absorption), no heat so can have closer to plants, and as you say no mercury. They also last longer. Good investment. That’s a very good idea! I just finished with the seed starters, but my sister is now beginning with the preparations and this will be of a great help for her. I’m definitely recommending this post to her and to some friends too. Thanks for the great suggestion!